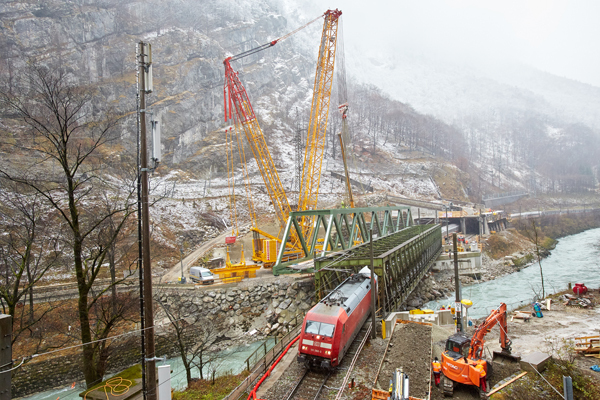 Prangl has used a 650t Terex Demag CC3800 crawler crane to lift the first bridge structure at the Austrian Railway Services (ÖBB) construction site at Pass Lueg. The railway bridge, which is more than 100 years old, had reached the end of its service life and needed to be replaced. In addition to the steel framework’s dimensions (70m long, 7m wide, 8m high and 350t), the confined spatial conditions proved to be a particular challenge for everyone involved. The site was located in a gorge with only rock walls on the left and right. There is only the Salzach river, a road and the railway line. 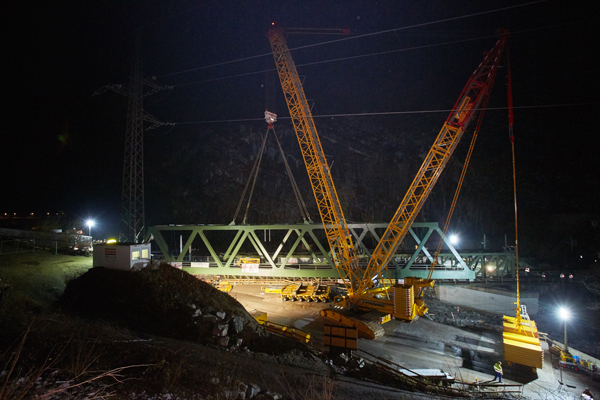 Since the construction site was located directly above the water and the dangerous Salzach gorge begins right below it, a water rescue team was on standby all night below the construction site. In the months leading up to the lifting operation, the new bridge was assembled approximately 300m away. The new enclosed framework, which rises more than a half-dozen metres and spans 70m, was built by the roadside. Due to the lack of space, the supporting structure had to be prefabricated next to the road. The Prangl team’s first task was to lift out the old bridge framework, which weighed a total 380t, load it onto three synchronised heavy-duty transport modules and drive it to the intermediate storage location by remote control. At the same time, the new bridge had to be moved around 300m to the lifting site before being transported. This was also carried out with the self-propelled heavy-duty units. In order to set up the CC3800 crawler crane, the Salzachstraße had to be completely closed in stages. A total of 40 trucks were used to transport all components of the large crane, which was then assembled in four days under difficult conditions. When fully assembled, the giant yellow crane including the load weighed 900t. The actual lifting work could not be started until shortly after the last train passed the track at 02:00. In order to ensure that the first scheduled train could start again in the morning, there was only a time slot of just under two hours available. The crane picked up the framework directly from the self-propelled heavy-duty modules. Due to the distance, the crawler crane had to change its position once and travel around 20m under full load. Despite difficult wind conditions, the new bridge was lifted with pinpoint precision. In order not to put the existing supporting structure of the adjacent second track at risk, both lifting operations (the old and new bridge) required the utmost concentration of the entire team, since the 70m-long structures were now 20m above the ground.